I picked up a bag of crochet lace at one yard sale while in Wyoming. It was marked $2 and tied shut. I thought why not...for $2 take a chance. When I got back I pulled out what was on top, the long rectangular pieces in the above picture. I flipped it over and then remembering what my friend Stephanie does with scalloped lace, I peeled back the 'petals' and low and behold....a giant crochet rose! Here's a little bit unwound...Mr. Wild estimates it's over 7 yards long. The widest part of the lace measures 5 1/2". I just love this thing...it's sits as is and looks like a giant rose pillow. 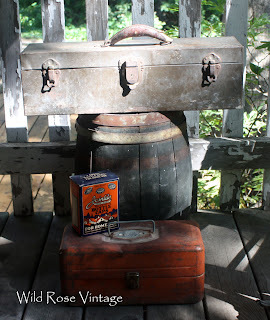 A few more finds form that day...Old Pal tackle box, a neat old tool box with a leather handle and a full box of cork lined bottle caps....full...all the way to the top!!! Aqua Windsor Melmac bowls for my vintage camper (that I don't have...yet...but I'm watching everyday)...I'm determined to find just the right vintage camper! And who could pass up all this color!!! 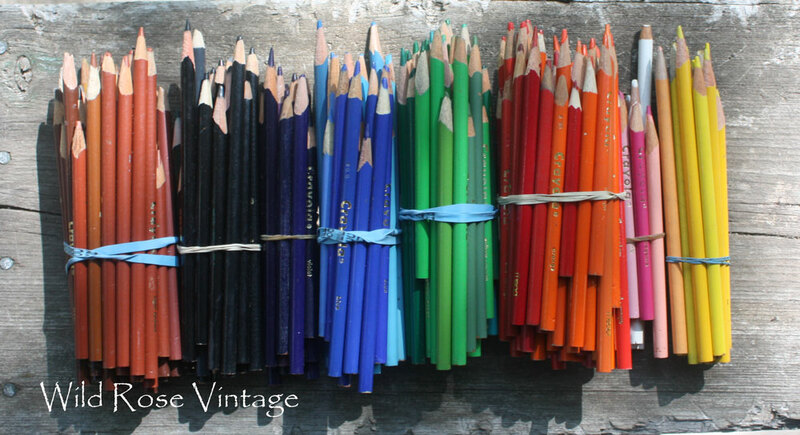 Pencils for $2. I was going to display them (and use them) in jars. But I found this neat idea on Pinterest so now I have to do this! Great great finds! That rose is beautiful. The rose is fabulous, and the tool boxes are always one of my favorite finds. Good job treasure hunting. Love it! My heart skipped a beat with the aqua melmac and then it skipped another beat when ya said vintage camper! LOL! What great treasures you found, I'm especially loving the crochet rose... it's beautiful. Good luck camper hunting!!! Oh my gosh!!!! This rose is absolutely gorgeous! I would keep it as a rose as it looks so pretty. The crochet rose is stunning, Faye! Love all your finds! Wow Faye! You sure are always finding the good stuff, huh? That lace rose is absolutely fabulous! I love how unusual it is, and how huge it is! What a treasure! I would definitely have to leave it as a rose!! It's perfect for you!! 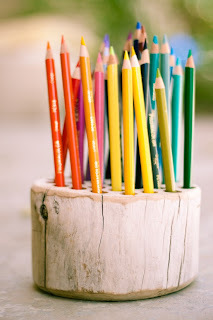 Love the colored pencils and the idea, too! Hi Faye ~ love that rose...what a great idea!! Your other finds are just great. 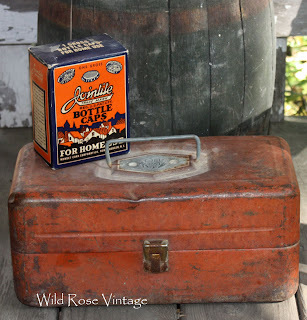 LOVE those bowls and can't wait til you find a vintage camper because I know it's makeover will be amazing! 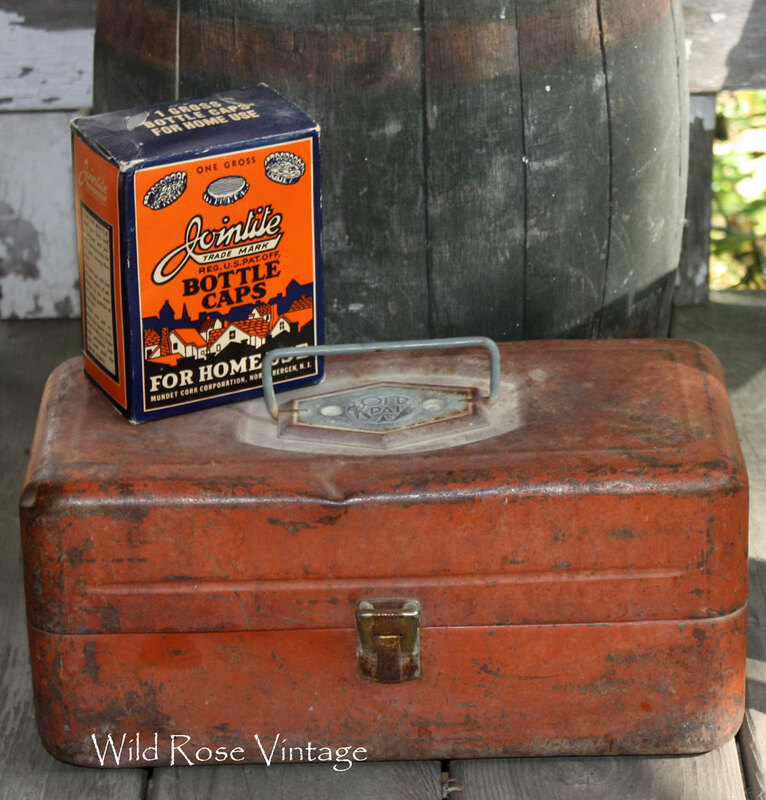 Have you ever seen Amy's Vintage Trailer blog? 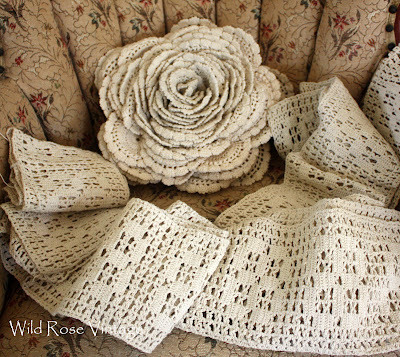 That rose looks terrific (if I made it it would look like an old dishcloth, I'm afraid - not crafty). 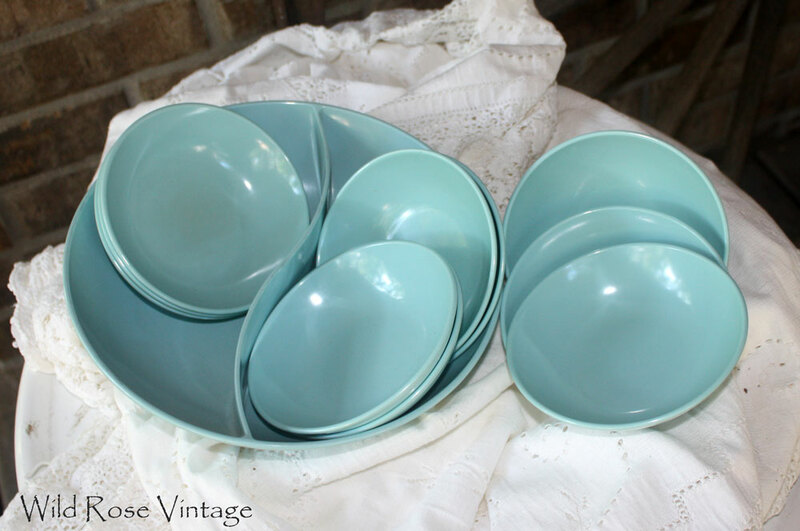 But those aqua bowls are drool worthy(oooh, but then I could use my lumpy dishcloth rose to clean up!) Love visiting your blog today! Amazing what you did with the lace!!!! Love the rose pillow. 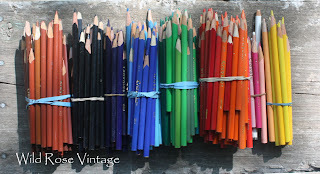 The photo of the colored pencils all in bunches is pretty cool too! 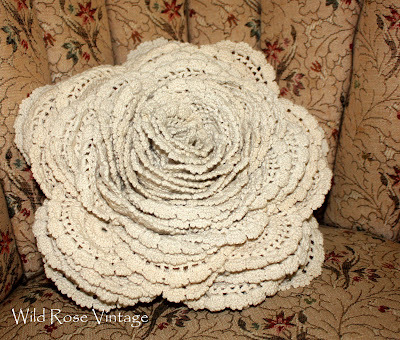 The loveliest crochet rose I have ever seen!! Love it! Visiting from Faded Charm. Love that rose! So cool! 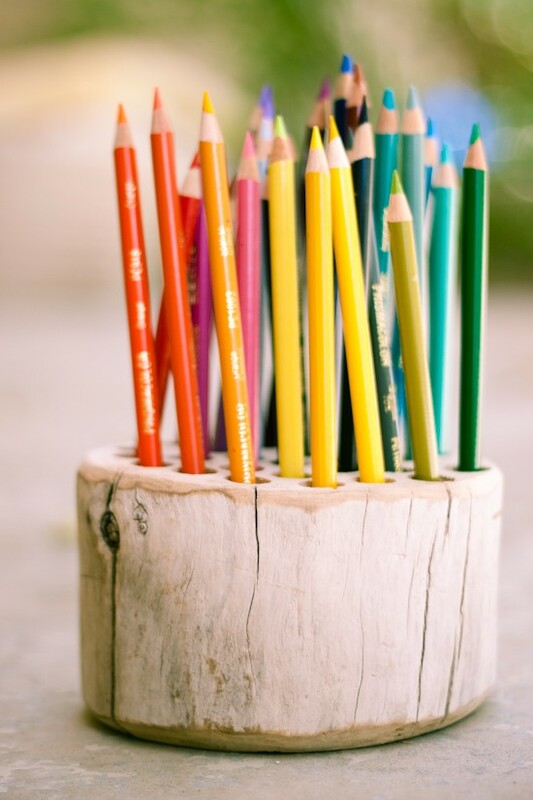 My friend has used crayons in all one color to fill jars, so the pencils should work out great, too! That lace rose is just to die for! Now I want to make one! Glad you got inspiration from my gigantic roll a while back! I WANT A CROCHET ROSE!!!!!! LOVELY, LOVELY, LOVELY! Sooo many goodies...love that old tackle box. I have a NIFTY THRIFTY TUESDAY party...would love to have you join in. What a beautiful rose! 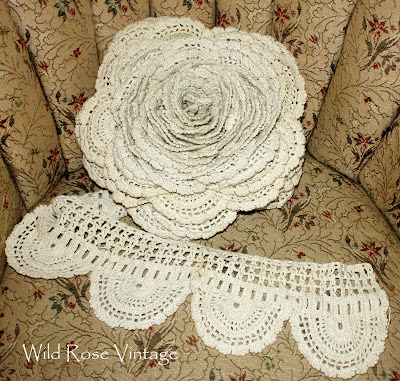 I may have to try that with some of my vintage crochet lace! What a treasure you found in your $2 bag! The rose you made is gorgeous and it's easy to see why you love it! You found some other neat items too and I hope you find your camper soon! Won't that be fun! your other treasures are wonderful too! Looks like you really know how to shop for the best "stuff". Are you glad you took that chance! That was such a great idea and it looks fantastic. Love those old tool boxes too! That rose is amazing! Love it and all your treasures this week! Thanx for coming to the party! I have a specail place in my heart for lace, and this rose sure is goreous. What a beautiful job you did with the rose. And, the colored pencils are a steal. Art supplies are never cheap. Thanks for linking it to Home Sweet Home! You have a very good eye! I love the rose and I love the pencils! Don't you just want to die when you see all that wonderful crochet that someone worked so hard on, for pennies?! But your rose is amazing! Found your feature over at Treasure Hunt Thursday. Love the crochet flower...I'm your newest follower! That rose simply took my breath away. Now it's my turn to find a length of crocheted lace to make one for me. I just saw this post, and wondered what you did with the long strait edged piece of lace? I have had a a 5' piece that my great grandma made that looks almost identical, and am stymied as to how to use it. thank you for your great photos!